I had, as always, a blast photographing last month’s Day of the Dead celebrations. It can take a lot of effort to energize yourself to spend two days walking for hours on end, taking the bus from town to town, staying up until past midnight photographing the candlelit altars in the graveyards… all by yourself! I’ve been asked more than one time by my friends here if I don’t get scared being the in the graveyard at night. Not once. Though last year it was a little weird being one of the only people in the cemetery at 12 a.m. while the Rays’ “Silhouettes in the Shade” blasted through the graveyard. It was my sixth time photographing the holiday here in Ajijic, Jalisco, and the surrounding area. Last year, a nearby town, Ixtlauhaucan de los Membrillos, set up a block full of altars and this year they shut down four blocks and gave out $150,000 pesos ($7,500 USD) for the best altar, best-dressed catrina and other prizes. This was all the motivation necessary for dozens of groups to set up altars dedicated to national figures as well as local family members. The Day of the Dead is, without a doubt, a melancholy holiday for anyone who has recently lost a friend or family member. But the mood can also be happy, with kids running over tombs in the graveyard and bands playing for mourning families. It’s a time for families to remember and pass on the memory of their ancestors with the current generations ago. 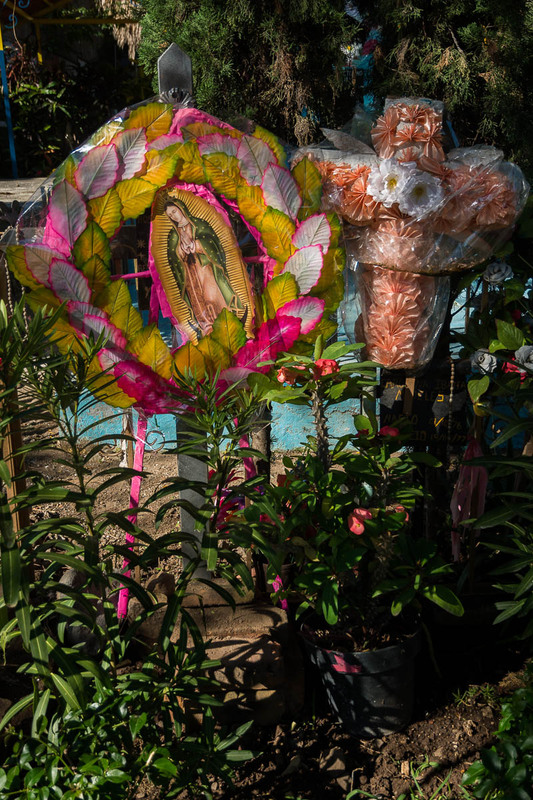 Hand-cut papel picado hangs above a grave in the Ajijic cemetery on the Day of the Dead. Marigolds left on an old headstone for someone who died in 1965 in the Chapala graveyard. Toys left on a grave on the Day of the Dead in Ajijic, Jalisco. November 1 is called Día de los Angelitos and families build altars in the afternoon for deceased children in the family. A young woman poses as a catrina on the Day of the Dead in Chapala, Mexico. A catrina holds a candle on Noche de Muertos in Chapala, Jalisco, Mexico. An altar constructed on a tomb on the Day of the Dead in Chapala, Jalisco, Mexico. Altar on the Day of the Dead for Chespirito, Mexican actor, director, screenwriter, songwriter, author. Regarded as the most important Spanish-language humorist of all time. He died in 2014. An elaborate altar in Ixtlahuacan de los Membrillos, Jalisco, Mexico, on the Day of the Dead. Ofrenda in Chapala, Jalisco, for the the 43 presumably murdered students from the Ayotzinapa Rural Teachers’ College who went missing in 2014. A relatively simple display in the Ajijic cemetery on the Day of the Dead. A Folgers coffee can serves as a vase for flowers on the Day of the Dead in Ajijic, Mexico. An altar under a tree on the side of the street on the Day of the Dead in Ajijic, Mexico. 600 terracotta skulls are lit up by candles, each representing a deceased town or family member. An altar for the 43 presumably murdered students from the Ayotzinapa Rural Teachers’ College who went missing in 2014. Detail of an altar for the 43 presumably murdered students from the Ayotzinapa Rural Teachers’ College who went missing in 2014. Handmade decorations light up an altar for a baby on a tomb in the Ajijic, Jalisco, graveyard. An altar for Lupe Tijerina of Los Cadetes de los Linares, a famous Mexican band formed in 1960. A bowl of soup left on an altar on the Day of the Dead. The dead’s favorite foods are often left on the altar. Dozens of items might be left at a Day of the Dead altar and each one has meaning. This altar for a famous Mexican musician is made from tens of thousands of beans, seeds and grains of corn. It was made Lupe Tijerina of Los Cadetes de los Linares, a long-time band formed in 1960. Detail of an altar for Lupe Tijerina of Los Cadetes de los Linares, a famous Mexican band formed in 1960. An altar lit up for a woman on the Night of the Dead in Ajijic, Mexico. Marigold flowers were hanging from this altar in Chapala, Jalisco.